When I read that this month's theme is Sai Miracles, I could not resist writing my own experiences of Swamy's Leela, especially, Vibhuti Leela. It was December 1997 Second Saturday, the day of our Sri Satya Sai Bhajan Mandali's Annual day. We started our function with Omkaram at 4.30 am and followed by Laksharchana, Shodachopachara Puja, Bhajan, Sathsang and Narayana Seva. We were through with all the programs and as the preparations for Narayana Seva was not complete we were sitting out side the premises of the clubhouse where the function was going on. Meanwhile, one of the devotees of our campus, Dr. D. Chaudhary came exited and told my husband that Swamy just visited his residence. We all inquired how it happened. He explained " I went to my residence with Raja Bhai, (another staunch devotee of our place) to quench his thirst. Suddenly we experienced smell of Swami's Vibhuti. Raja Bhai started yelling Swami has come! Swami has come! He started singing Bhajan and searched the house. As he was doing so we traced the smell of Vibhuti to a Swami's Photograph in our pooja alter. The whole photograph was covered with Vibhuti. We lighted the incense stick and came to inform you all". We all went running to see the first experience of Swami's Vibhuti miracle. From the formation of the Vibhuti, Raja bhai explained that Sai had visited us as Radhakrishna. There were imprints of Bhagawan's feet also in that room. The sight was so fantastic. I read many a time about this and was thrilled to see personally the Vibhuti miracle. We are blessed. In 1999, again we are fortunate to witness another two miracles of the same at Keonjhar, a town of Orissa, which is situated about 150 km from Cuttack. One morning, One Scientist from Bhubaneswar, who was at CRRI, Cuttack came and told us that Vibhuti miracle has happened at Keonjhar a day before and it was more fantastic than the one which occurred earlier at Cuttack. We started at Cuttack immediately and reached Keonjhar traveling on a road which lost its originality. It can be said that it was a path of gravel only. We did not feel any exhaustion since Bhagawan Baba blessed us. As we reached the place, it was not very difficult to trace the blessed house. In the first house, Vibhuti in huge quantities was showered the whole house. Even their pet dog, was found with a quoting of Vibhuti. Large number of devotees from far and wide places visited the house. Here also, Baba's footprints were seen. We were told that many devotees placed photographs of they're chosen deities in the pooja room and honey from some photographs, ghee from some photographs were oozing out. Luckily, I always carry Bhagawan's photograph in my vanity bag. I placed that in the altar, prayed and returned to witness the second miracle. The second miracle was more fascinating and interesting. Every Thursday, the inmates of the house perform Bhajan and Arati. Since a month prior to this miracle, Baba's photograph in the altar, which was placed on the Simhasan, used to move around the house especially during the Bhajan time. That photograph was being spotted in the neighboring hall during the Bhajan along with other photographs which were placed for the purpose, move out and go to kitchen some times, go and occupy it's own position in the altar. Some times the water which was placed in a glass near the Simhasan used to be half full. 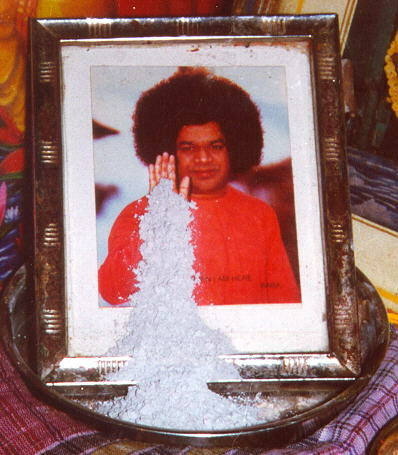 The Vibhuti Leela in this house was more convincing that Bhagawan Sri Sathya Sai Baba is Siva- Shakti Avatar. It was because, along with huge quantity of Vibhuti, Vermilion (Kum Kum) also was splashed on the Photographs of Sri Shiridi Baba, Sri Sathya Sai Baba and other photographs. After witnessing the Miracles, we were returning home and while coming back and two back tires got punctured. Because Swami is with us always, even though the traffic on that route is thin, and it was late, there was shop just nearby to attend to us. We got the work done and reached home at about 1-00 am. In the next morning, when my husband went to see how the car is, he was astonished to see that all the four tiers were flat. I don't know how we could reach home? Next day, we received a phone call from the devotee where we placed Swami's photograph, that ghee oozed out from the photograph and they have sent it to us through our common friend. In another two days we received the photograph and we could see the oily markings on the photograph and sweet smell was still persisting. This is not a fiction or imagination it is a real happening. Bhagawan Sri Satya Sai's miracles cannot be comprehended. As he says, no one can know his real nature.